It's been more than a year since Sony sold the Vaio brand to Japanese firm JIP, and now it seems the company is working on a Vaio smartphone. There were hints about the Vaio smartphone in February, but some solid evidence appeared this week in the form of box photos (above) and certification by Japanese authorities, according to Phone Arena. The Vaio phone, for now known as the VA-10J, was reportedly certified back in December, but this was just discovered. 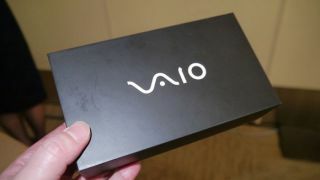 As far as the photos, the phone's box was reportedly shown by Vaio executives themselves. This all points to the Vaio phone being released soon - at least in Japan. Whether it comes to other regions after that remains to be seen, but you shouldn't get too excited even if it does; the VA-10J has middling specs, including a 5-inch 720p display, a quad-core Snapdragon 410 chip, 13- and 5-megapixel cameras, 2GB of memory, 16 GB of storage, and Android 5.0 Lollipop. Vaio also announced a slew of other devices in the last month, including a laptop with 15-hour battery, so it seems the brand may be back in a big way no matter how you look at it.